Travel Management is a tough business – we’re constantly challenged to explain complex systems and interactions among multiple vendors managed through a dozen systems. Vendors don’t make it easy. Airlines benefit when employees search out of policy for the lowest fares and inevitably compare a three day advance purchase against a twenty-one day AP offered on countless websites. Airlines have also monetized many benefits travelers took for granted three or four years ago. Government regulations have forced airlines to offer more transparent pricing which has led to improvements that protect travelers. Comparison shopping is more effective now since most fees and taxes must be disclosed up front. 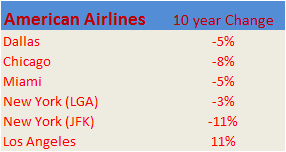 Airlines suffered from unexpected fuel price spikes beginning in late 2005; since prices have remained volatile consumer awareness about the problem is very high. Airline marketers have learned how to transform their pain at the gas pump into revenue. Fuel prices routinely exceed labor as legacy airlines’ highest expense. Carriers add fuel surcharges aggressively to capture more revenue from each seat, and most travelers have no idea how much fuel their flights consume – this awareness gap has allowed carriers to regain pricing power. Data from the U.S. Department of Energy. Fuel surcharges stand out as an especially onerous fee since they are ineligible for corporate discounts and can even exceed the base fare for some flights. 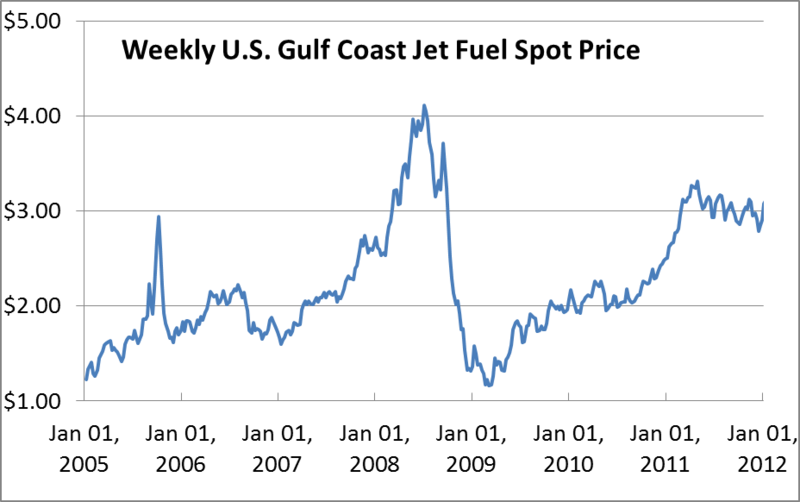 Let’s face it, we’ve seen some big fuel surcharges in the past few years. All of this has me wondering how much of the passenger’s fuel bill does the surcharge cover? Here’s the punchline: in many cases airline fuel surcharges exceed the cost of fuel needed to carry the passenger. That’s right – surcharges don’t just offset the incremental cost of higher fuel prices, they often exceed the total fuel bill. Customers and clients share a widespread belief that surcharges represent a fraction of the gas bill and most are surprised to learn the truth. Typical charges for Atlantic flights are $200 each way (between New York and London), while Pacific charges are more likely to be $400 per passenger each direction (between Chicago and Hong Kong). The fee is not arbitrary, but I wanted to determine if coach passengers were being asked to subsidize the higher fuel costs required to move a passenger in Business Class or First Class? Essentially, is each seat carrying a burden relative to its density or floorspace requirement? The key to this question is to calculate the fuel required for each seat then multiply that result by a particular airline’s average fuel expense (available in their annual reports). Airlines select aircraft for their operating costs and reliability. I’ve selected a Boeing 777-200 for this analysis since they are currently in production and can be found on routes across both the Atlantic and the Pacific. Although not as large as the Airbus A380 or Boeing 747-400, the 777 is much larger than some of the Boeing 767’s and 757’s in the Atlantic market. Next, a review of the interior configuration options at Boeing’s website demonstrates that a business class seat requires about twice as much space as a coach seat, and a first class seat requires double the amount for business class when you consider galleys and lavatories. Boeing reports the 777-200 aircraft could hold 440 seats in a coach class configuration; combined with other performance data I determined this plane can achieve 81 miles per gallon for each passenger in an all coach cabin. For these calculations our model aircraft holds 301 passengers, with 227 in coach, 58 in business class and 16 in first class. Normalizing the results as described above gives us the results displayed in the table below. The evidence is clear and I was surprised that fuel surcharges actually covered more than the fuel expense for the seat. Coach passengers may be subsidizing other passengers, but given the competitive fare environment it’s unlikely that $1,000 round trip fares to Asia are covering their fully allocated costs. The real story is that rising fuel expenses threaten to overwhelm carriers, and at least for now, travelers in premium cabins are catching a break from an unpredictable expense. This led to my next question, what do I do with this information? Travel Managers must be able to plan. For this reason, well-known Industry forecasts are always in high demand and fuel is often featured as the largest unknown variable. Since fuel is a volatile input it makes sense to create a sensitivity table that shows us the per mile fuel expense to provide information that allows us to predict pricing action in a particular market. You can find current fuel price information at the US Department of Energy website. To use the table: 1. find the current fuel price in the left column; 2. select the price per mile rate that corresponds to the cabin your travel policy allows; 3. multiply the O&D distance for a specific market. You can find mileage information in your GDS, or at Flightaware.com. Flightaware is an excellent source for real-time operating statistics about most flights – consider adding it to your bookmarks. 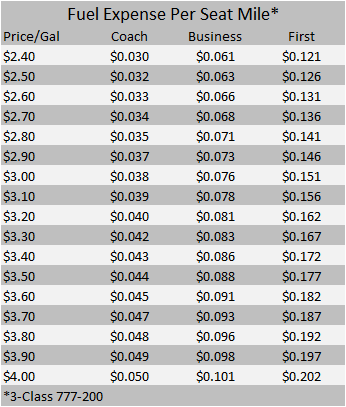 At $2.50 per gallon, the fuel expense works out to little more than 3.2¢ per mile for each coach seat, double that for business class and around 13¢ for a seat in first class. Although I ignored the revenue generated by cargo, which would reduce the cost burden on passengers, I also left out a load factor adjustment that would drive the per seat costs higher. The next time someone asks you about a fuel surcharge, you’ll have everything you need to show them how reasonable the expense is – or isn’t. You Won’t Believe This About Southwest Airlines. You won’t believe this. I didn’t, and I’ve spent more than a decade staring at airline industry data, so maybe I’m the only one who didn’t see it coming. I’m going to show you something that runs counter to conventional wisdom and what we know and hear about at every ACTE conference or GBTA convention. It’s well known that airlines operate on lean margins. They lose a lot of money during recessions and only break into double digit profits during the more profitable second and third quarters, but rarely on an annual basis. As airlines continue to squeeze more revenue from every seat the average load factors have increased to the point that the summer surge isn’t even noticeable. Airlines combine the 100% achieved on Sunday’s, Mondays, Thursdays, and Friday’s with the low 80’s on Tuesday, Wednesday and Saturday to achieve an 88% load factor for the month. Any hiccup or foul weather leads to hours of delays since there are so few spare seats to accommodate stranded passengers. Strong finance organizations are required to manage the complicated flows of people and capital. Young airlines act as if marketing will be in charge forever, but losses and maturity have a way of sobering investors, and eventually the CFO will take over. Every time Spirit, Jetblue, Southwest or Virgin America enter a market the local press wave banners announcing that low fares have finally arrived in Madison, Longview, or Springfield. How do they know? The CAB reporting structure survived deregulation and data is still required monthly to be reported to the Department of Transportation on Form 41. Every US carrier with scheduled operations and revenue greater than one billion dollars must submit the form. It contains detailed information about the carrier’s financials and operating statistics. The data provides a rich view about how the airlines operate their equipment and move passengers and cargo between every city pair they serve. Here’s a link that describes the available data sets. You can create your own reports here. A table I found recently was particularly interesting since it contained information about average departure airfares, taxes and fees for passengers departing the top 100 US airports. Since this table doesn’t distinguish between International and Domestic traffic it would be difficult to support meaningful decisions with this – this is not a comprehensive variance analysis, it’s just a back of the envelope look at four or five major airlines, so you should be cautious about using my conclusions to support your decisions. There is one section that contains information that looked meaningful – a comparison between average fares from 2001 and 2011. Out of curiosity I looked at the price changes for American’s hubs. Most showed a decrease – not too surprising given their financial condition. The data is in the table below (all tables are from BTS 3rd quarter 2011 vs 3Q 2001 – click the link above for the most recent values). Next I moved on to Delta’s hubs. They have a fortress hub in Atlanta (under pressure from several LCC’s), but their operations in Salt Lake City, Detroit, and Minneapolis are stronger. Overall a mixed result but they’ve demonstrated more staying power than American. How did that compare to United’s operations in Denver, San Francisco, Washington? Little to brag about here; see the charts below for details. Here’s United (includes Continental – Houston and Newark). It’s remarkable that Houston Bush was up 12% in a city that hosts a Southwest hub. Meanwhile Newark was up 1% in an extremely competitive metro area. Continental should be applauded for holding their own, especially when the Dallas Fort Worth area offers Continental a pure play to compare against (favorably). American hosts their fortress hub at DFW, while Southwest occupies Dallas Love Field, a situation very close to Houston, yet DFW average fares are down 5% while Houston Bush is up 12%. That’s a big difference in a business that counts margin in basis points. Who has pricing power? It’s not American or United in Chicago; and prices in Denver and San Francisco should scare any competitor away. Southwest. Industry professionals describe them as the quintessential low cost carrier. This is a company that is proud of their small sales force, doesn’t allow seat assignments and only offers one cabin, and they’re pricing champions. Those are impressive results. The next time someone excludes Southwest from a list of industry leaders, remember, driving revenue is one of only two ways to increase profits (Profit=Revenue-Cost), and Southwest is terrific at growing revenue. We’re surrounded by advertising designed to convince us that some product or activity is green. Lighting, transportation, and hot water combine to form a significant portion of our daily energy consumption. Looking outside our homes, transportation is the largest controllable expense and energy user. Efficiency is tricky and subject to opinions and interpretation so I won’t create an absolute efficiency measurement here. Given Delta Airlines’ recent announcement that they will purchase an oil refinery to better manage their fuel costs let’s compare transportation on a relative basis and use empirical data to show us how different forms of getting around compare against one another? I define efficiency as an amount of fuel required to move one person one mile (a passenger seat mile). On that basis we can rank Ford F150 pickup trucks against Global Express 550 corporate jets and a Toyota Prius against a motorcycle. Two additional ways we might look at this question are: 1. What’s the maximum efficiency a particular mode could achieve? 2. What’s the most likely efficiency a given mode will achieve? Data and calculations have been updated to include a Tesla model S, and four airplanes that entered service since this was originally published in 2012. The new list includes the 737MAX, Airbus A321 NEO (New Engine Option), a Boeing 787-900, and the Airbus A350-900. When people are asked which is more efficient, a Boeing 737 or a Toyota Prius, most make a common error and allow speed to affect their judgment about efficiency. The answer depends on the number of full seats. In fact, a 737 filled with a typical number of passengers is more efficient than a Prius with a single occupant. The Prius excels when you start to pack people into it, but most respondents assume that modern jet aircraft couldn’t compete against a hybrid car. This exercise showcases how efficient certain vehicles are. Our runaway winner is the world’s fleet of large tour busses. Operated at capacity these vehicles can move one person between Los Angeles and San Francisco with one gallon of diesel fuel, while a 737 will consume five gallons, and a loaded Prius needs more than two gallons per seat. The other end of this spectrum is interesting too. How does traveling in First Class by commercial carrier compare to the fuel ‘cost’ required for an individual to travel onboard a private jet? Before we answer this we need to calculate the fuel burn for a first class seat. Boeing reports the 777-200 aircraft could hold 440 seats in a coach class configuration, so we know this plane can achieve 81 miles per gallon for each passenger. Assume that Business Class seats use twice as much fuel as a seat in coach, and First Class seats consume four times more fuel than the average seat in Coach, then for the Boeing 777 we would expect to achieve 20 miles per gallon for each First Class passenger. Compare that to the 13 miles per gallon each seat could generate in a Gulfstream Global Express 550 if every seat was full! Even filling half the seats in the plane would require a fuel burn more than three times higher than consumed by a First class seat on a Boeing 777-200ER and that ignores the frequent ‘repositioning’ flights private jet travel requires. This table normalizes fuel efficiency based on passenger seat miles. In this example, a Prius with four people would generate four passenger seat miles for every mile driven, while a Boeing 737-800 could generate up to 175 passenger seat miles for each mile flown. This exercise also points out a paradox in aircraft design – a single aisle Boeing 737-800 is nearly twice as efficient as the larger, double-aisle Boeing 777-200ER. The design requirements for long-haul international flying require more lavatories, large galleys, more storage space, life rafts and a host of other overhead not needed for shorter hops. This paradox creates an opportunity for shorter stage long-haul flying as fuel costs continue to rise. 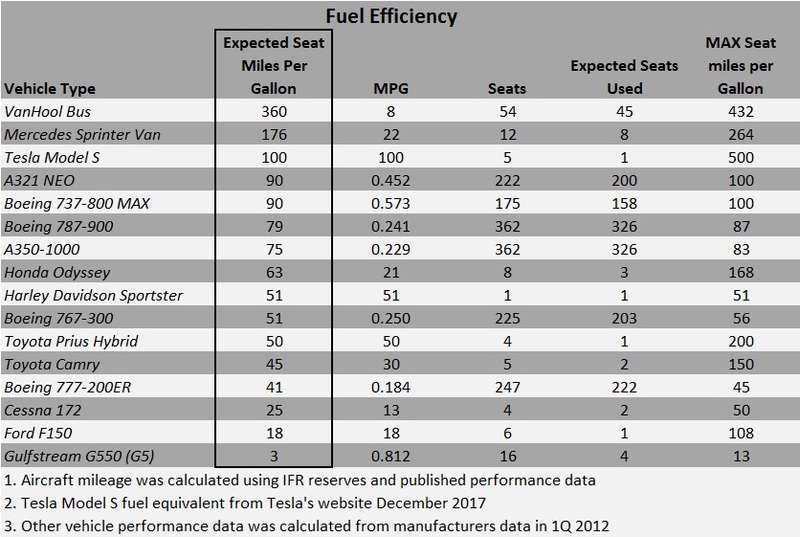 I’ve already shown that absolute fuel burn does not correlate to efficiency the way seating capacity does. Commercial aircraft can move many people very rapidly, and they do it at least as efficiently as cars, and advanced aircraft designs like the 787 Dreamliner, and A350-900 are closing the gap with their single-aisle peers. Motorcycles and minivans are great for moving one or a few people, but it’s very clear that technology scaled for personal transportation doesn’t beat mass transit today. Buses and mini-buses continue to shine in a world where liquid fuels are scarce and expensive and it will be interesting to watch how efficiency demands will shape international and domestic travel in the coming decades. The Secret Behind Airline Fuel Surcharges.